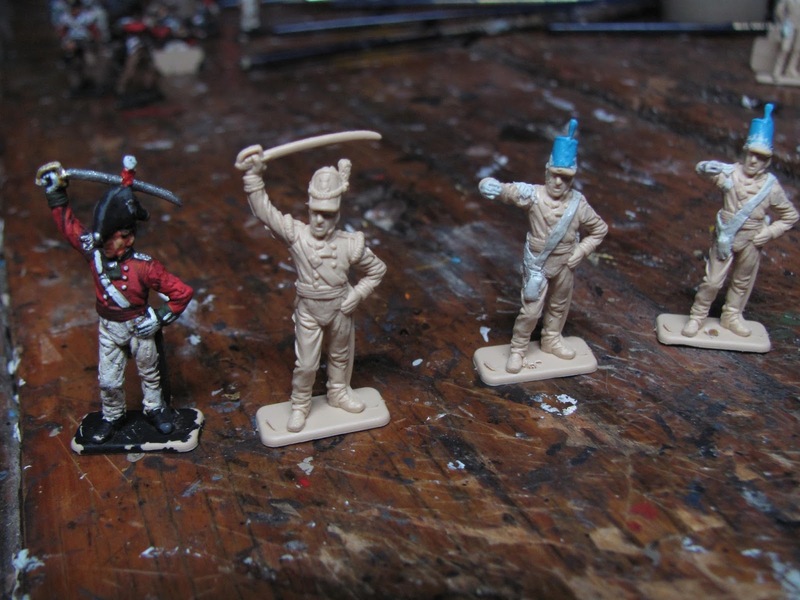 I've been having a lot of fun converting half the Italeri 1815 British (the half without stovepipe shakos) to Peninsular British - mostly some trouser alterations and shako-swapping from an abysmal set of Hat Light Infantry. 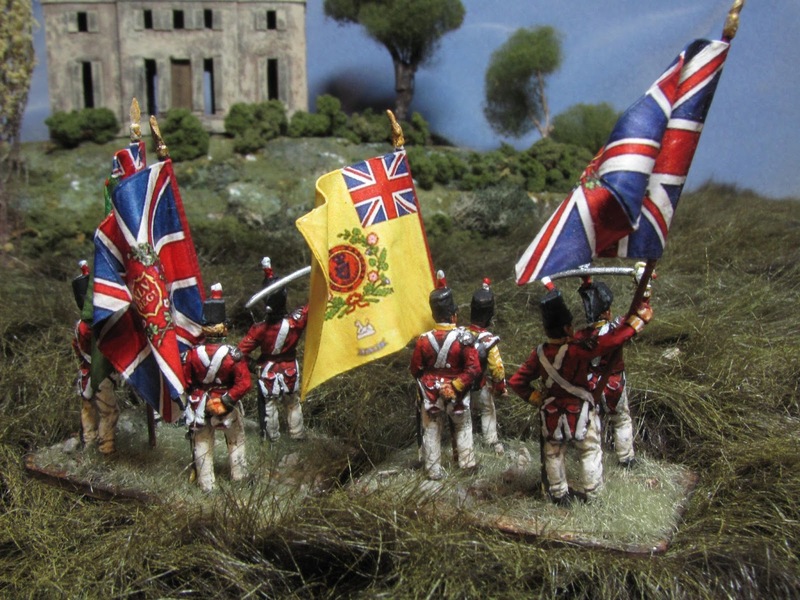 But I have also had to produce some standard bearers. 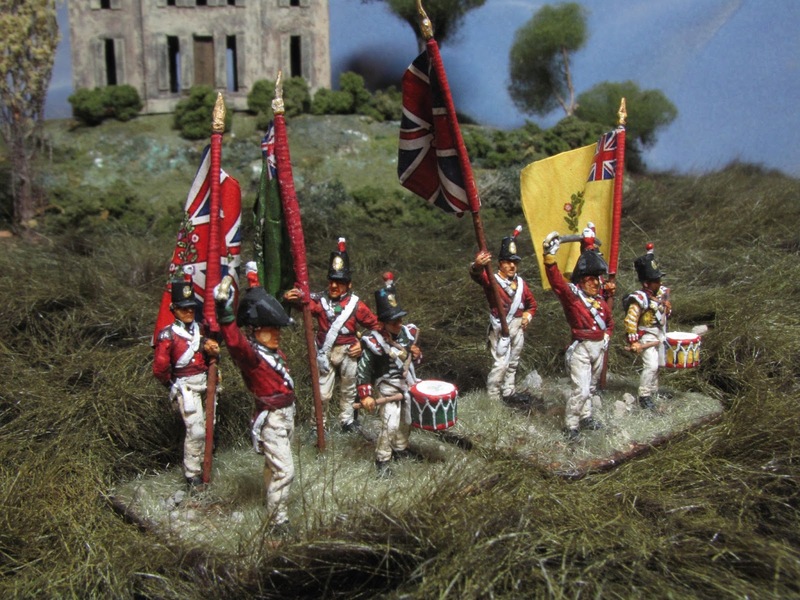 A sergeant figure converted fairly easily ( I cut away his gear, lengthened the tails of his coat) but I wanted two per stand (regimental and union colours) and didn't want duplicate ensigns. So I've gone to work on the command figure, which has proved a bit more ambitious. 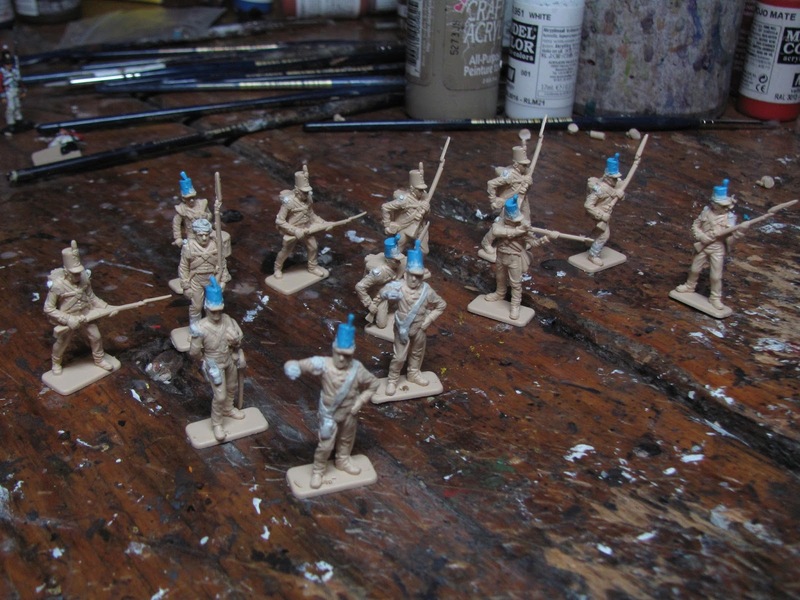 I posted early painted conversion results (with only one ensign) with my Connaught Rangers post but thought I would share some WIP's. These are really my first attempts at this level of conversion and look pretty rough, but I'm pleased with the results when not too close! 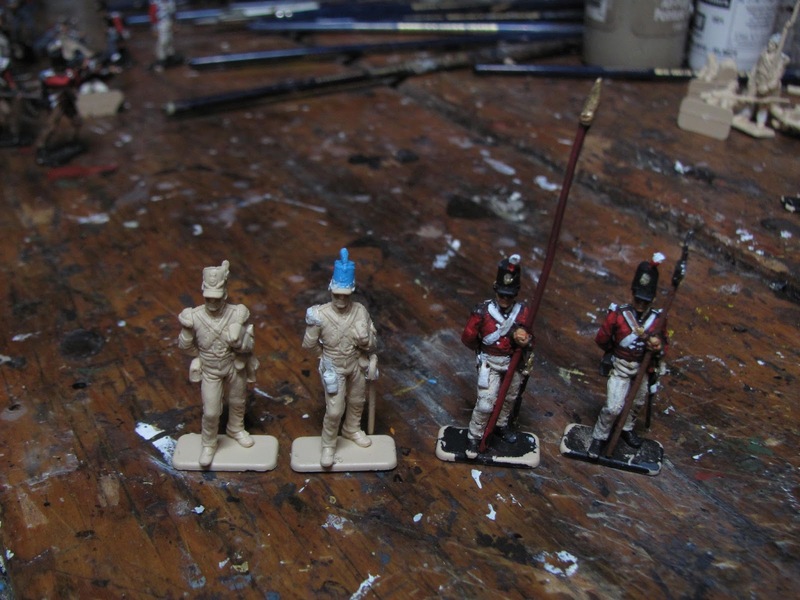 A pic of all the conversions, mostly involving trouser alterations, shako-swapping, shoulder-wing-cutting and tuft-adding. 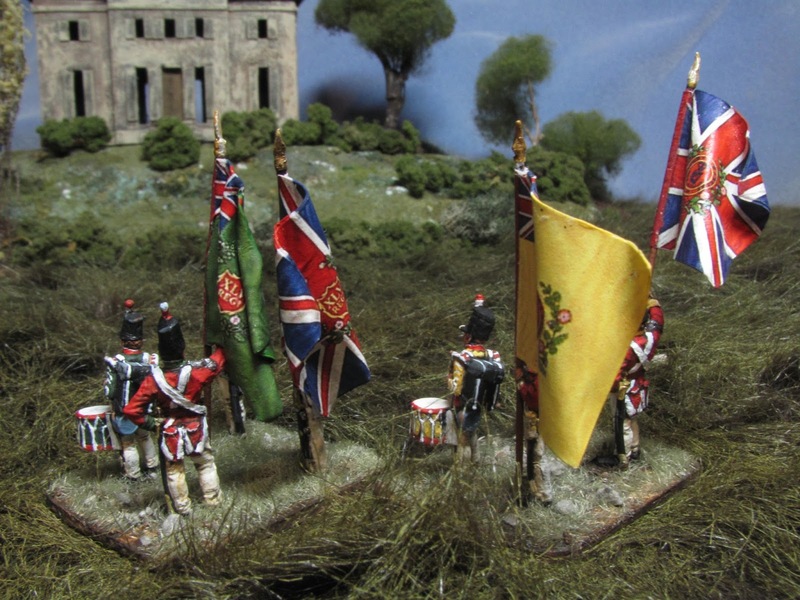 Close up of the commander, with bicorne and tails added for the Peninsular captain (painted figure), and then two more modified as ensigns. These called for new shakos, the arm cut off and repositioned, the hand moulded, a belt added for the flagstaff, a sword hilt added in the scabbard, shoulder wings cut off, epaulettes added and coattails lengthened. For Peninsular they should also probably have boots but I ran out of steam! The earlier modifications of the sergeant. For the ensign it meant shako swap, gear and swagger stick cut off, sword added, hand drilled for flagstaff, spear point added to flagstaff, pouch created for staff, and tails lengthened. The sergeant figure was simply a matter of swapping the shako, cutting off the shoulder wings, adding tufts and sword and making a pike. Thanks for the encouragement. And yes, Blue Falchion, I do find an increased fondness for the figures you have laboured over in this way. I will post some photos of the final results soon. Great conversions, Bill. Cannot wait to see them all painted. Congratulations. Here are the two command stands, 88th and 45th. May I ask what grey modelling material you are using? It's a two part epoxy putty made by Tamiya (Smooth Surface). I did have a bit of trouble getting it to adhere to the plastic despite the fact that I had washed the figures with soap and water prior. But there may be some other trick I'm not aware of. In the end it did adhere and stayed well stuck after drying.